My ascent of Kilimanjaro is something that some people can relate too; but my descent is something that few people have seen or experienced. 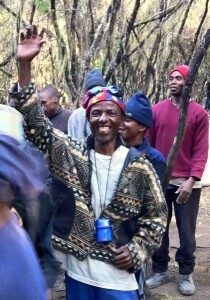 Kilimanjaro mountain man: Melchior, our outstanding lead guide. I decided I would run down the trail to the main gate, the day after the Roadmonkey team had summited Mt. Kilimanjaro. I had asked a couple of my fellow teammates to join me but only our co-leader, Pierre, decided to join me in my descent to the bottom of the mountain. After packing up camp, in the upper tier of Kilimanjaro’s rainforest, Pierre and I were about to take off down the trail when our lead guide, Melchior, appeared. He would have to accompany us down the mountain, he explained, as clients were not able to arrive at the main gate without their mountain guide. Melchior, I should explain, is a man of some years and experience. He is a grandfather, and on the day he joined Pierre and me, he was descending Kilimanjaro for the 55th time. Whether running to the bottom seemed to him like a sensible thing to do is impossible to say. It was enough that two of his clients wanted to run for Melchior to become a runner that morning, and to join us, stride for stride, with the same grace and quiet confidence with which he had guided us to the summit the day before. When we left camp, the trail was dry and wide and the three of us were able to run comfortably side by side together. As we descended the trail, the conditions around us changed. The vegetation became a dense canopy of overhanging branches and it started to rain. The trail became very slippery as wet clay clogged the treads of our shoes. As we stopped talking to concentrate on the trail conditions, we started hearing sounds coming from behind us. All of sudden, porters appeared with packs (many of them large and clanking with pots & pans) on their heads running up behind us and passing us as if we were walking. To avoid us, they had to jump over logs and dodge rocks. On Kilimanjaro, one sees the latest and best in technical footwear, almost all of it on the feet of western hikers. The porters, who climb and descend the mountain carrying as much as 50 pounds of luggage on their heads, wear an assortment of discarded, donated or borrowed boots, shoes, runners and sandals. One porter ran past us and had to go around a stump. His flat, treadless shoes were unable to take the corner. As he started falling down and his load slid off his head, he executed a remarkable, impromptu act of physical grace: Instead of coming to a stop to regain his balance, he put out his left hand to catch himself, touched the ground briefly, and then, in the same moment, grabbed the duffle, placed it back on his head and kept running without missing a step. The author, in orange top & white cap, celebrating with mountain guides & porters on the path she ran down, one day after summiting Kilimanjaro. One reason I chose Roadmonkey for our trip was the confidence that a company dedicated to adventure philanthropy would strive to treat our porters well. But while I watched this porter recover from his fall, on a wild descent under the watchful eyes of my own guide, I realized that I was also lucky enough to witness first-hand the strength, agility and dedication of a proud people and understand the effort put into sharing their mountain with the world. That connection, brief but unforgettable, is part of what it means to me to be a Roadmonkey. 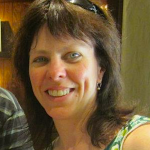 Diana Kilby, in addition to being a 2011 Tanzania roadmonkey, is a special education teacher in North Vancouver, B.C., Canada. When she’s not working with children with developmental disabilities, you can find her in the B.C. backcountry, mountain biking, trail running or skiing with her partner, Bruce. This entry was posted in Adventure Philanthropy, expeditions and tagged adventure, culture, Diana Kilby, East Africa, exploring, kilimanjaro, Roadmonkey, running, Tanzania, travel, volunteering, voluntourism. Bookmark the permalink. Follow any comments here with the RSS feed for this post. Trackbacks are closed, but you can post a comment.